Congratulations to our Winners and to all who participated in our March Design Challenge! Some really great entries were made this time around. Keep it up, folks! Congratulations to our February Winners and participants! What fun it was to see how inspiration and imagination took each of you in a different direction; and I thoroughly enjoyed hearing that many of you who participated really pushed outside of your ‘comfort’ zone – and had fun too! Now let’s get ready for this month’s Dash of Inspiration Design Challenge! Post the PID (card number) and the URL (public storefront link, please DO NOT post a link to your Manage Cards area) as a post in the challenge blog. We’ll forward your entry to the jury. Category: ANY category for Family Relation >> Mother/Mom ………………………………………………………………. As well as featured on the GCU Public Facebook Page – nearly 13,000 followers, now THAT’S exposure! 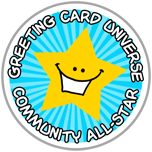 Your card will be added to theGreeting Card Universe Design Challenge Winners Pinterest Board. Check out these tips, tricks, freebies, and tutorials from our own GCU Community Blog which would all be helpful in this month’s Challenge. Glad to hear it! You can not be officially entered until your card has been approved by the GCU Review Team. So, when that is the case and you have a public marketplace link to your card, please stop back by and leave it here – I’ll gladly enter you in the challenge at that time. Hi Tam – okay I found your card. For future challenge entries, please wait until the card becomes available to the public marketplace and add the link to the card, not your store. The wording on the card is a direct quote from my mother. She lost my sister at birth and a kidney, four years before I was born. She wasn’t supposed to have more childen, but was determined to have one, so I was born. I meant the world to her. My entire life she would tell me, “You are the beat of my heart.” Her words still echo in my ears fourteen years after I lost her. She was MY heart! I love and miss her everyday. Hi Sherry, received and entered. What a great memory for you. I understand the bond, I was an only child of a single mother and my mom wanted me more than anything in the world – so we too were very close until I lost her. I’m so sorry for your loss. Mothers are so special. My parents divorced when I was twelve, and I didn’t have a relationship with my dad until after my children were born. Mother and I became even closer after the divorce. She was a very caring woman. My high school friends even wanted her to join us all the time. She later took in ten teenage boys and three girls who didn’t get along at home, and helped straighten them all out. My husband is one of the boys. Mother played matchmaker. I’m still in touch with two of the “boys” after 45 years. 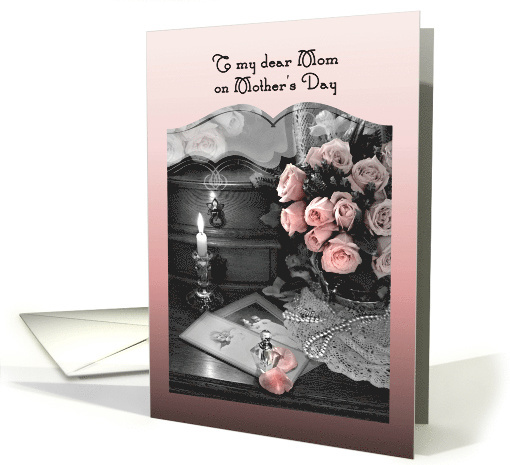 Doreen, I created another card, but since we can only enter one, I couldn’t fast track it. Obviously that means it won’t be available for awhile. Once it’s approved I’ll put it up on the place where we can show other cards. Hope that’s ok? Sherry, not only is your card beautiful, and your story made me cry a little. I hope you win this challenge. What a lovely story behind your card, Sherry. I just love the quote so much! Entry received, Julia, good luck! Here is my entry. I was inspired by my Mom and how she always stood out from all of the other Moms! I was a lot younger than my siblings as she had me at age 37. She called me her bonus baby! Anyway, I spent a lot of time with just her and she was always so kind and even tempered, involved in all sorts of activities, and always doing something creative or to help other people. She just turned 90 and up until about 2 years ago she still volunteered at the hospital, and worked for hospice! Thank you Betsy! Entry received and entered – good luck! Your card is really beautiful! Entry received, Ramelle, thank you and good luck! As it turns out, my entry doesn’t remind me of my mom at all. It had started out that way as I found an inspiration piece on the internet with a redbird (cardinal); and boy, did my mom love those birds! But instead of using a bird, I ended up using a brick border and ribbon inspired from that piece, found a quote that I liked and went from there. The card turned out a little grittier than my usual style, which is nothing like my late mom … or me for that matter! Thanks Betsy! Your card is great as well. BTW, my mom also worked as a hospice volunteer … what a great organization! Good luck to you! Doing something different is what these challenges are meant to inspire 🙂 Delighted to hear that was the case for you Robin. Good luck in the challenge! I’ve enjoyed seeing the variety of cards for this challenge. 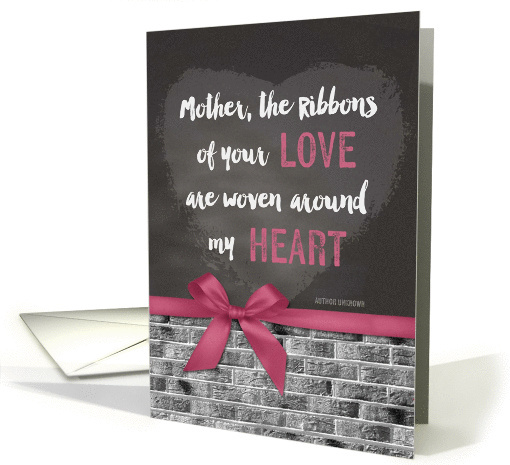 Cisillia’s “gritty” brick and ribbon card is just perfect for those moms who may not be a fan of lace and roses like my mom. There’s something to suit every mother’s taste. 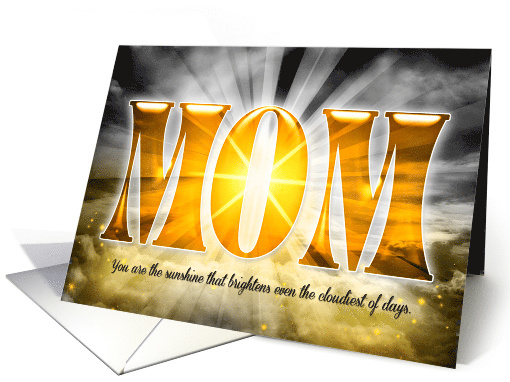 The new cards created for this challenge will be a nice addition to GCU, just in time for Mother’s Day. I love Sherry’s heartbeat card! That design could be beautifully adapted to make a Valentine’s Day card for mom, too. Good luck, all! Thanks Ramelle. Interesting idea. I’ll consider it. Good luck, Cisillia! Consider your card entered. Oops . . . I meant Robin’s card, with the brick wall. Cisillia’s is great, too. Loving them all! Sneaking an entry in just in time — thank you to the reviewer for a truly fast-tracked approval! Plenty of time, Christi, your entry has been received. Good luck! Congratulations to Ramelle and Robin! This was a very close running with all submissions being very competitive and individually shining. Congratulations to all participating artists for some strong designs and stepping outside of your comfort zone! These are wonderful and fresh contributions to the Mother’s Day category. Thank you! Congratulations Ramelle and Robin! Your designs surely are award winning! Thank you for your kind words. And Congratulations to Robin, too. I knew that hers would be a winner! I hope all the entries see a boatload of Mother’s Day sales. Congratulations Ramelle and Robin. Beautiful Cards. Thanks ladies! And congratulations Ramelle on your well deserved 1st place win! I love your card! Congratulations to Ramelle and Robin for two very creative, loving and thoughtful Mother’s Day Cards !! !